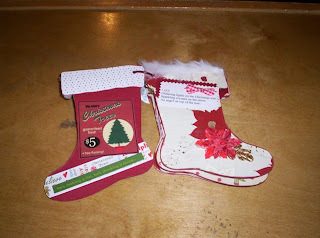 This is another kit from Carolee's Creations. By kit I mean cut out wood pieces-well MDF to be exact. The MDF is nice and smooth and takes minimal sanding to be ready to work with. This kit comes with the tree base, trunk and 5 bowers. To complete this, I just picked 5 green-ish papers. It would be lots of fun to do in about any color really. 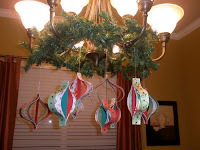 I used mod podge to glue the paper on and to cover the paper. It really does not need the mod podge over the top of the paper, but I was on a roll. 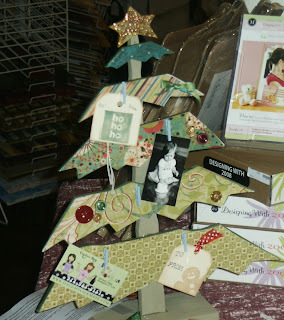 To paint the tree I used a dark brown paint and then used Tim Holtz crackle paint over the top. (that is separate experiment that I will share another time). 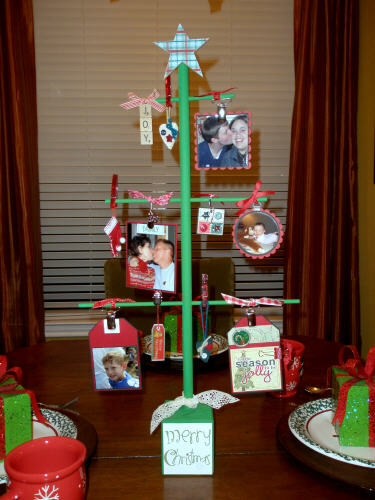 I used hot glue to put the pieces together and also to put little clothespins on the 'limbs' to hold pictures. If there is any advice I need to give it is about the clothespins. 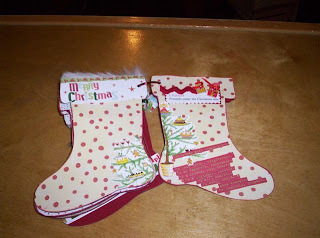 Since I used mod podge over the paper, the hot glue did not stick very well. 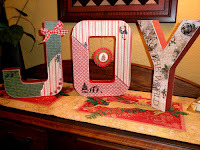 My recommendation is to a) not use the mod podge over the paper or b) stick the clothespins on while the mod podge is wet-it would hold it better I think. 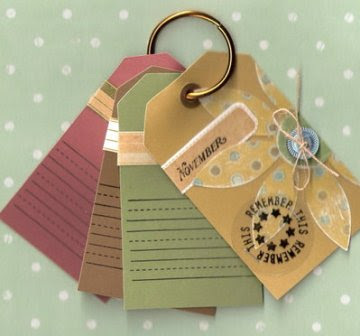 Of course, there is nothing that says clothespins are a must, it is just what they suggested. I used some stickles on the star. I added some buttons and a little bit of ribbon for decoration, but I stayed pretty light on the decorations. This is a great project and allows a lot of room for customization! Better pick yours up--not many are left. Well, what do you think? 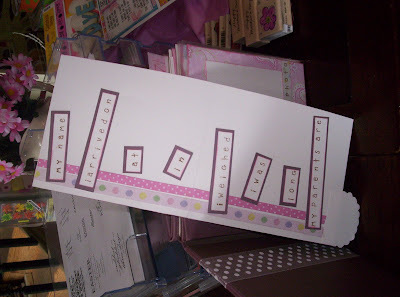 Here is a picture of cards from the swap. 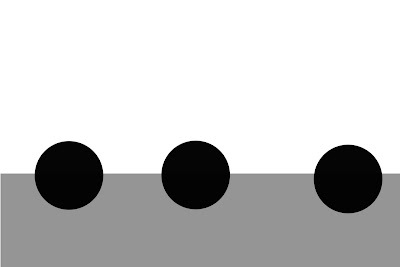 As always, there are a lot of interpretations of the template and many unique and creative designs. 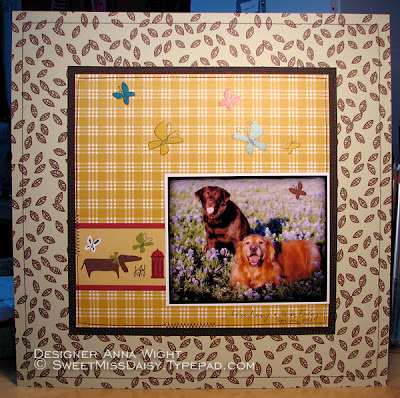 From the use of a Sam's card for an embellishment to old patterns to coloring of cute stamps and cut outs, the group was inventive. So many beautiful cards. Some cards for fall, for Christmas and some for everyday use. 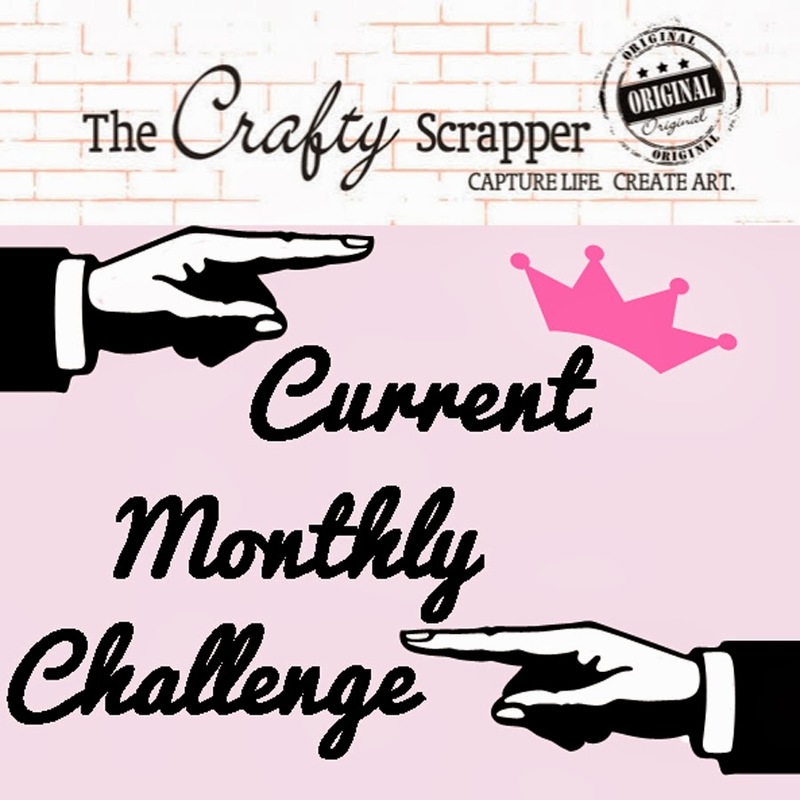 Want to be in the next swap? Here is all you do. 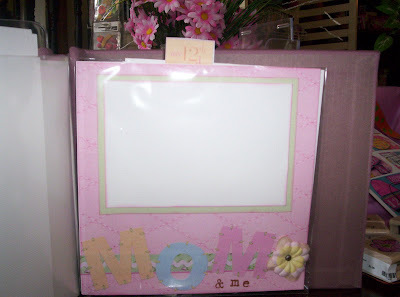 Make 10 cards using the template below as your guide. Bring your cards to the store by the due date. 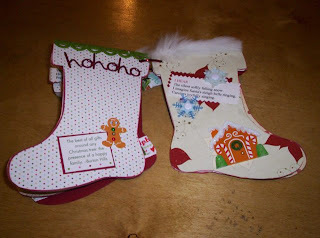 The next swap is due December 6, 2007, and you will get cards and a thank you for playing gift back on December 10, 2007. 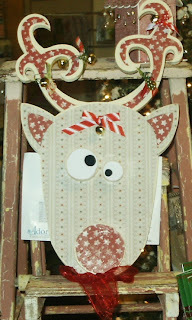 I thought I'd show you the Rudolph that I made the other day using the Carolee Creations pre-cut wood kit. 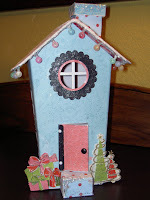 It took very little to complete the look; some paint (cream colored) 2 sheets of paper (Carolee's), little scraps of white and black card stock, a piece of sandpaper, 4 - 6 bells, a few little snips of ribbon, some floral wire, a larger ribbon piece and mod podge. 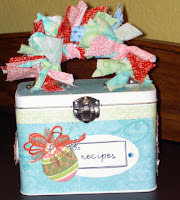 I could have used a chenille stick (pipe cleaner) too, but didn't have one at the time. I would have used two screws to put him together, but didn't have any handy, so did hot glue-which is what they used too I think. I made him as close to the example the company gave as possible--not my usual way of doing these, but wanted him to look like the pictures. He is pretty cute. He is large. His face is about 10 inches tall, then his antlers are another 8 inches or so on top. He would be great to hang on a door as is, or put him in a wreath. Very inexpensive for a gift too-I thought. 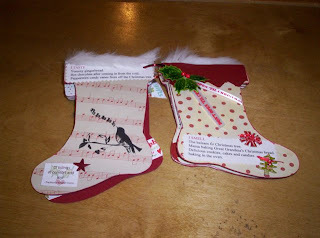 The example is at the store along with more kits for you to create your own variation of Rudolph. 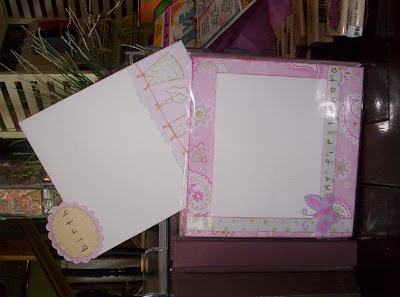 I used new paper and rub-ons by SEI to create this page. I like the double-sided papers -- they're a bit heavier, and give the page more substance. I pulled out the ol' sewing machine for this layout as well. The pups in the photo are my own Miss Daisy and Mister Farley. They really are the BEST of friends. You can see this layout in the shop, along with many others created by fellow design team members! OK, we've told you about it, but NOW you have to come see it for yourself! 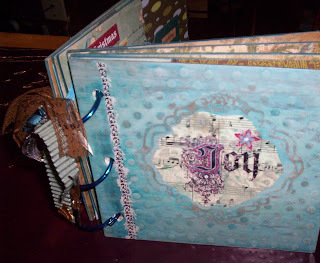 Its so YUMMY, I promise you will want to touch the buttons and the many rows of chipboard, felt, etc. You will feel like a kid in a candy store! IT'S HOT, HOT HOT! Join us for our first ever Creative Cafe Art Bar "Happy Hour" this Friday November 9th from 6-8pm. We will offer exclusive projects created by the designers of Creative Cafe that will be created right at our very own Art Bar! The project cost will vary depending on the project - anywhere from $1 - $10. Participants in the weekly happy hours will receive a special Creative Cafe Club Card. It features a coffee cup for each happy hour workshop you attend that will get punched. When you fill your card, you get one happy hour workshop free! Annette and I will have several projects on display for the upcoming "Happy Hours", so come by and check out our new candy store! Also the store has been transformed into a Christmas Wonderland! Wait until you see all the new Christmas collections and Christmas projects the design team have done, its a great place to get ideas. I will post pictures throughout this week. This is a great idea for a baby gift. 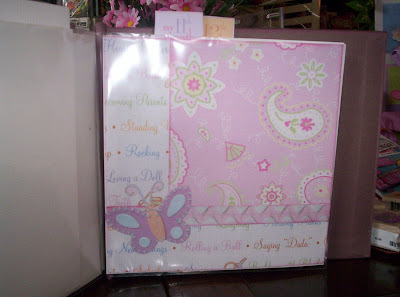 This little family album/baby book was done with a stock 8 x 8 album. 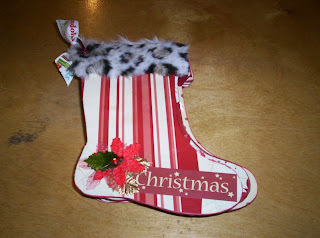 The front was easily embellished with a cute ribbon and a tag stamped with the baby's name (since it was known). Each of the paper sleeves then has a little folded page inside of it. When the page is in the book, you see the tab for the insert and the actual page that was done for the book. The insert can be just a 8 x 8 size paper, or could be a folded page if you wanted. 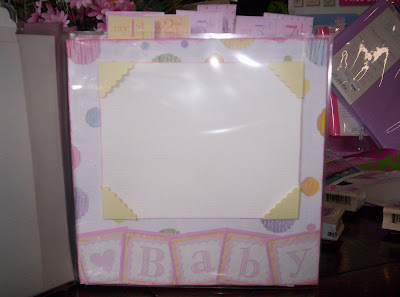 For instance, this first page shown is an adorable layout for a first photo, tucked behind it (and pulled out for showing here) is another page that could have journaling, other photos or cards perhaps that the mother wanted to save for the baby. Notice that this one is a folded page, so when opened up it reveals another area for words, journaling, photos or whatever you as the designer wants to put there. This is a view of the book, looking at the tops of the pages with all the tabs showing. Notice each one in this book is a month. 1 month, 2 months, etc. And then just a few of the layouts that again are hiding a great insert behind them. 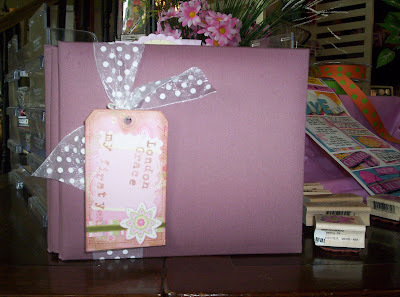 Hope that gives you some ideas for a book you might need to do!